I've been procrastinating writing this story. An initial mixture of embarrassment, disappointment and ho-humdrum kept me from wanting to publicize it. Now, two weeks later I have a different outlook. I am thankful, proud and blessed to have been able to make this hunt and to take this animal that is a true trophy to me. I personally feel my trophy hunts are measured in the quality of the whole and not the size of the animal taken. This starts 8 years ago when my good friend Sam told me to apply for three particular zones in CO where he has property to hunt mule deer. 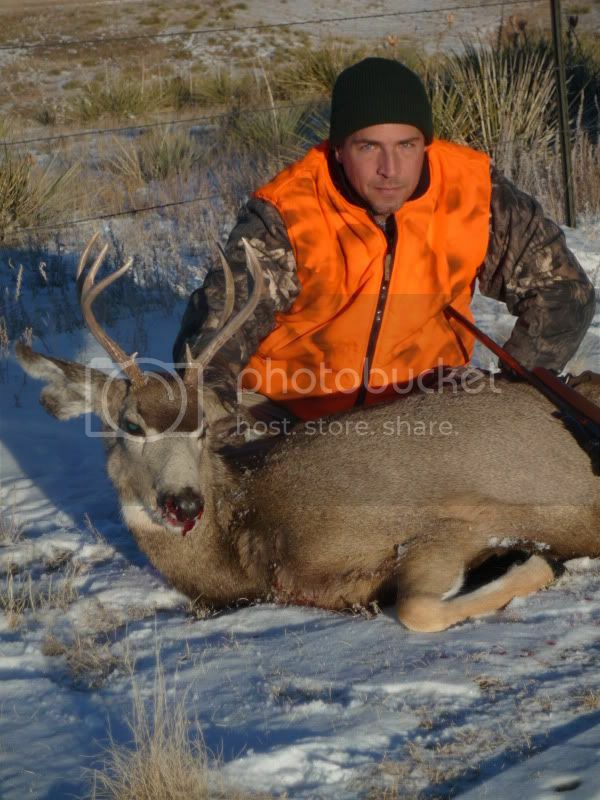 I've guided mule deer hunts successfully in four states (prior to licensed guide requirements in two of them). However, I'd never personally taken a mule deer. After 8 years of applying for a tag I finally got one for the area I wanted, the late season I chose and a buck only as I wanted. The timing was great since Sam recently retired from a big city PD after 31 years - he had plenty of time to scout and be prepared for me. My friendship with Sam was founded on our mutual love of shotguns, bird hunting and bird dogs. We had shot prairie dogs together but never big game. The dates of the trip coincided with the OK pheasant opener, so Sam invited CRS to join us in CO via OK when we were done with the pheasant hunt. The goal was to knock down a mule deer quickly so we could bird hunt CO. Well, the best made plans went to heck when the 5 day forecast for clear skies and 38 degrees was shattered with unforeseen blizzard like snow and temperatures in the negative numbers. Up until now, Sam had sent me photos periodically of mule deer bucks "hanging around" on his property in the same draws and ravines since summer. Day one had the visibility down to 100 yards or so. We glassed the best we could but only found one 2X1 buck bedded in a coulee. 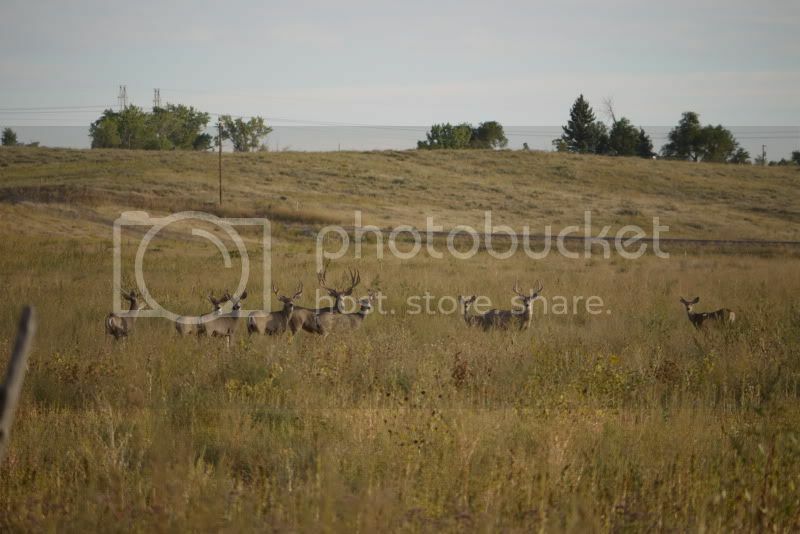 In spite of sun up to sun down efforts, that was the only muley we saw. Day two was a balmy 21 degrees but the snow stopped. We glassed for deer and saw a buck we knicknamed "Big Guy" on the border of the property. Over the border is a "conservatory" that is off limits to hunting. We put Big Guy to bed and went back in the morning. Day three Big Guy did not eat breakfast with the does and small bucks. I spotted a 3X4 that Sam said we could easily shoot by going around a grassy knoll and coming over the top at him. I decided to pass since Big Guy was markably bigger. That afternoon I left Sam and CRS at the truck while I sent 1.5 miles to the border of the property where Big Guy was known to frequent. After an hour and change I hunkered down in the snow and waited. I had does and a little buck within 100 yards of me but Big Guy showed up at last light where my rangefinder said 536 yards. I am confident out to 400 yds and would make a known 450 yd shot with a solid rest, but I do not shoot more than that. Darkness won out and I hiked back to the truck. Day four we found several muleys that I passed on because of small size. I made a stalk and ran out of cover on one group with a shooter. My rangefinder said 1130 yds (it only registers to 1200!) Then we found "Monster". On the neighbors property we located a buck that had 14 visible points with several smaller trash points (at least 17 points we could count) and a spread in excess of 34" based on the distance between trees he was bedded between. We knocked on the White's door to gain permission but nobody answered. We tried his fathers house but no luck. Sam called and knocked on that door many times throughout the day and night but nobody was ever home to ask. We were able to get within 45 yards of Monster and enjoy his massive figure. With a few hours of light left I headed for our property corner to try my luck with Big Guy. I had does and bucks within 40 yards of me. Big Guy showed up at 510 yards but would come no closer in the fading light. When I couldnt see I attempted to get up but I had froze to the ground. After a struggle, I freed myself from the ground but waddled back up and down canyons with frozen pants legs and sleeves in the 7 degree temperature. At the truck, I took my pants and jacket off with much difficulty and put them in the pickup bed, still in a three dimentional state. I lost all feeling in my right big toe. Day five we glassed again. Coyote hunters had plagued us ever since the snow stopped and the rancher was concerned about his range cattle so he began to round them up. All this activity caused the deer to flee the property we had access to. Mr. OB let us hunt his place in the morning but the whitetail deer had moved in and pushed out the muleys. We went to ask some other ranchers for permission to hunt. On the way we spotted a deer we named Tres, he as a big 3X3. Mr. K let granted permission to hunt his place after an initial refusal. I told him my whole story of how I ended up at his door and he gave in and said, "Go ahead". We hunted that evening in K's Canyon but did not see a deer until it was too dark to shoot. It was Tres. On the morning of the sixth day CRS and I were both run down with a cold. CRS was a trooper as he got up a 5 every morning with me and toughed it out in the below freezing temperature every day. Sam was right there acting as guide, host and tour guide. These guys were putting off the bird hunting to get me a deer and it was not happening. I made a vow to take the first legal buck I could find fair and square and put an end to this madness. CRS and Sam deserved thier bird hunt - they earned it! In the darkness on the way to K's Canyon we saw Big Guy standing proud on the conservatory property where he knew he was off limits. That was a rub in my face. Then we passed Tres standing on the opposite side of the road where he too was safe. A double hah-hah to me. We climbed K's Canyon and reached the top as the sun came up. Then it all came apart-and together! A buck appeared on the opposite canyon. He was no Monster or Big Guy but he was standing there like a gift for the taking. I attempted to shuck a round in my trusty rifle. This rifle and I have been together throughout the world for work and play for over 30 years. I've taken over 400 big game animals with it and it has never let me down. It is no tack driver, but it is the one go-to rifle that I trust and know above all others. I continued to attempt to shuck a round in. The bolt was frozen - a result of keeping it in the truck for the whole week including overnight. Moisture condensed and froze. After a few warm breaths and some vigorous rubbing the bolt opened but the follower was frozen down to where a cartridge was not up high enough to be pushed by the bolt. I tried to open the floorplate and it was frozen. After some force the floorplate popped open and four rounds fell into the snow. I dug around and found one. I had an uneasy feeling about having only one round so I dug more and found one more cartridge. With two now loaded and the gun un-fozen and working I looked up to see the buck still there! My rangefinder said 254 yards. The buck was facing me head-on but this is a shot I have taken before and am not afraid of. I aimed and squeezed off the shot. I heard a distinct "wiiinnnnggggg" when the shot broke. The deer remained standing there, looking around. I quickly shucked in the last cartridge and looked around. Wouldn't you know it, I hit a single strand of barbed wire about 35 yards out. What are the odds of a .284" bullet hitting a .175" piece of wire? Well, the buck was still there so I put the crosshairs back on his chest and pulled the trigger. I was surprised to actually see the bullet for a split second just before it struck the deer. The buck pile up immediately and started to slide. He was only 254 yards directly across but when he came to rest he was 1/4 mile downhill over snow covered rocky terrain. Getting to him and getting the buck back up was a chore. Sam met me half way up and helped. The 7mm Mag 160 gr Accubond entered the front chest, took the top of the heart, split the lungs and exited the rear. The rifles performance was as I have come to expect. While I field dressed, skinned and caped the deer, Sam and CRS mended the barbed wire fence. 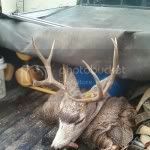 I was relieved to have a mule deer. He is nowhere near the size of Monster, or Big Guy and he's a wee bit smaller than Tres, but he's mine and I earned him the hard way. The scenery, terrain, and two great friend were the best part of the trip. CRS and I saw a hawk knock down a pigeon twice and finally break its wing. Then, a feral cat found it and ate it with her kittens. We also saw a feral cat stalk and pounce on a dove and eat it. We saw antelope in the hundreds, nearly as many deer and dozens of coyotes. Sam and his wife were great hosts with awesome food and their friend Donna provided us with her home for our lodging. Sam had a deer tag too so we hunted deer two more times for him. Oh yeah, the bird hunting was awesome too! Great read, especially for one who has not hunted yet. Thanks for sharing it. Great story, thanks for taking the time to tell it. I could feel the cold and and bitter/sweet fustration of having a great animal so close but so far. Gald you got one in the end. A trophy for sure. When hunting isn't about the antlers, horns, etc. but about the hunting. I loved the story J. I think that's a fine deer, a great shot, and a superb hunt. Anybody would be proud regardless of the antlers size. The cool thing is every time you see that buck your mind will be filled with memories, and that's what it's all about brother! As always, thanks for sharing your great stories.